Description: Early miniature map of north eastern coast of the United States, and then French colonized North America ("Francia") now Canada. Latin text on verso. Coloured. Description: Virginia. Highly decorative cartouches. Coloured. Description: Important map of the East coast of the United States based on the first English map of the middle and northeastern colonies. Description: Miniature map of Long Island, Connecticut, Rhode Island, and Massachusetts. Coloured. 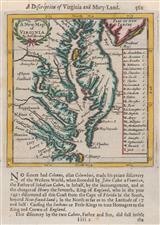 Description: Rare early sea chart of the Chesapeake Bay by the leading family of Dutch chart-makers. 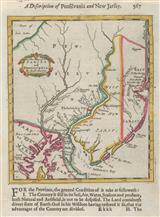 Description: New Jersey, Pennsylvania and part of Maryland. A detailed miniature map with panel of text. Coloured. Description: Early map of the North American East Coast from Florida to the Great Lakes. Coloured. Description: Early Dutch sea chart of the New England Coast. Coloured. Description: Virginia. 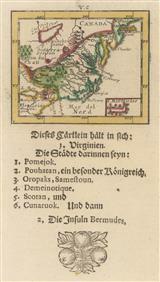 Miniature map with German text. Coloured. Description: Valk and Schenck edition of Jansson's "fundamental prototype map of America". Original colour. [Burden 305]. Description: Virginia to Florida. Cartouche shows the battles between the French and Spanish at Florida. Coloured. Description: New England and Virginia. Original hand colouring. [Burden 247, state 3]. Description: Virginia and Chesapeake Bay. Beautifully engraved map with elaborate cartouche, rhumb lines and compass rose. Strong impression. Description: Virginia, Maryland and Carolina. Celebrated map of this region, famous for its illustrated cartouche. Original colour.